Has the CPU’s fan been giving you problems lately? The fan is an important component of the CPU and needs to be taken care of. It keeps the processor cool, and we all know the impact overheating can have on our system. So, if your CPU fan is making too much noise or isn’t functioning properly, you should replace it before it is too late. How to Replace a CPU Fan? 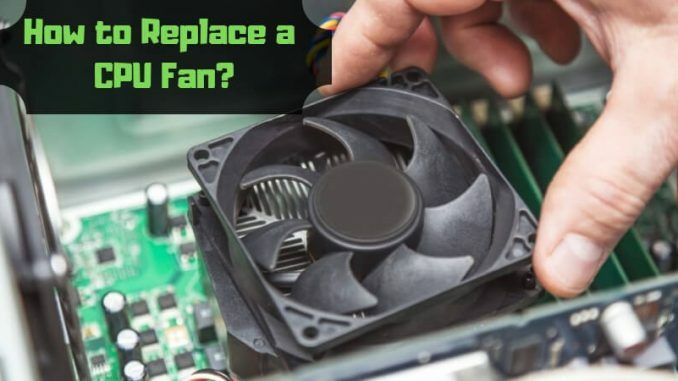 While the steps to replace a CPU fan are quite straightforward, you have to be meticulous and attentive because even a small error can damage your CPU. Turn the computer off and let it rest for a few minutes. Do not touch anything while the computer is still running. Open the computer and locate the fan. If you see any covering such as a duct, remove it first. Now, when the fan is clearly visible, find the connector. A wire usually connects the fan to the motherboard. Gently disconnect the connector without being brutal. Continuously pulling or being harsh will compromise the connection and when you replace the fan, you will face issues. The fan will also be clipped to the processor. Once you detach it from the motherboard, you should detach it from the unit. Simply unclip it, and it will come off. Depending on the model, your fan may be screwed in. In this case, you will need a screwdriver. So, you need to take a call based on what you are working with. You can now easily bring the fan out. Make sure, even here, that you do not just pull it. The force you apply should be minimal. If the process is difficult, just twist the fan slightly. This will make things easier. Once you are done, take the new fan and follow the same steps in reverse order. Within a few minutes, you will be done! It is important that you do not rush into this process because any loose connection can destroy your fan and may be even the motherboard. Switching on the computer when the fan isn’t connected securely is a major risk. So, at every step, especially while installing the new fan, ensure that all connections are secure. Be gentle but be firm. If this whole process is daunting and you are really not the kind of person who engages in too many DIY electronic projects, it is best to rely on a professional for this. Be wise and take the right decision. All the best!